We're one of five partners to have founded the Alan Turing Institute for data science. Our researchers explore society’s toughest challenges and strengthen the links between academia and technology industries. Experts from Warwick are working alongside the worlds best researchers to make the UK a global leader in big data. The Institute is named in honour of Alan Turing, whose pioneering work in theoretical and applied mathematics, engineering and computing is considered to have laid the foundations for modern-day data science and artificial intelligence. 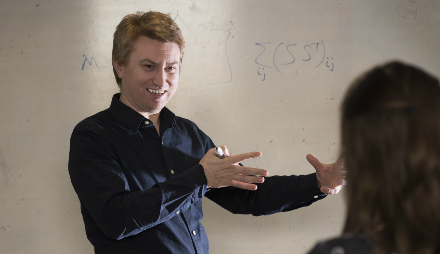 The Warwick Data Science Institute (WDSI) builds upon the great power and range of Warwick's research expertise across the Mathematical Sciences, to promote research collaborations that will shape the future of data analysis. Trained as a computer scientist, with a PhD from Warwick, Professor Cormode has experience working in industry and academia. He was recently awarded the Adams Prize for Mathematics. Truly multidisciplinary, you’ll find groundbreaking big data research going on in the faculties of Medicine, Science, Social Science and the Arts at Warwick. Three students from our Data Science undergraduate degree describe what it is like to study data science at Warwick and what it means to them.